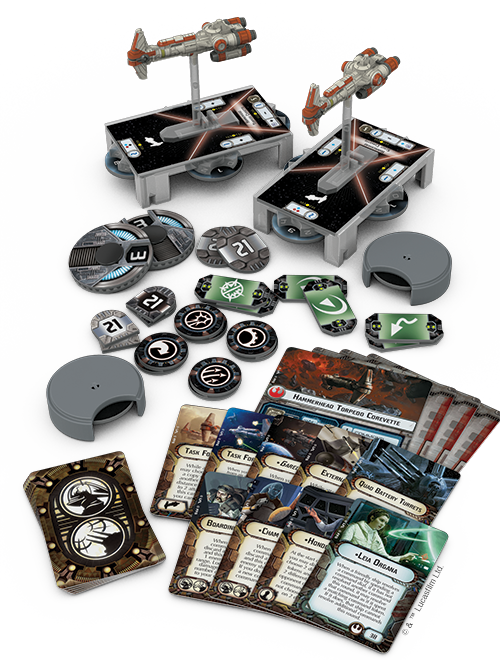 Fantasy Flight Games is proud to announce the sixth wave of Armada expansions! Light on ships, but heavy on new ideas, Armada Wave VI features two expansions—the Imperial Light Carrier Expansion Pack and the Hammerhead Corvettes Expansion Pack. Inspired by Star Wars Rebels and Rogue One, the expansions give us three new ships—one Quasar Fire-class cruiser-carrier and two Hammerhead corvettes. While these are solid ships, they are by no means the biggest and baddest battleships you'll find in the Star Wars galaxy, but if you overlook the threats they pose? You do so at your peril. Accompanied by a host of upgrades designed for close-range combats, these ships can punch well above their weight. They can unleash devastating alpha strikes, coordinate their allies, catch their foes unprepared, and strip down their enemies' defenses far faster than you might ever suspect! Capable of acting as a mobile starfighter base over occupied worlds, the Quasar Fire-class cruiser-carrier is an ideal garrison vessel. It can support operations even in the most primitive conditions, and it bristles with laser turrets that allow it to defend itself while its fighter craft are away on crucial missions. The Imperial Light Carrier Expansion Pack brings the Quasar Fire-class cruiser-carrier to your tabletop as a pre-painted, medium-base starship with six hull, three dice in its forward battery armament, and a whopping squadron value of "4." 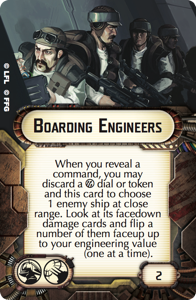 It's supported by two ship cards and a total of ten upgrades that provide a new commander, three Title upgrades, some additional offensive firepower—and the game's first dual-slot upgrade. Requiring and occupying both the Weapons Team and Offensive Retrofit upgrade slots, the Imperial Light Carrier's Boarding Troopers can wreak havoc upon an enemy's defenses, punishing anyone who flies his or her ship too close to the Quasar Fire-class cruiser-carrier that you'd rather keep back behind your fighter screen. 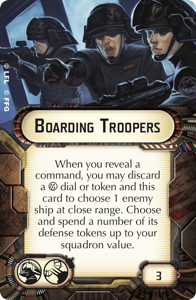 The Boarding Troopers' ability to spend your opponent's defense tokens is further amplified when used in conjunction with Admiral Sloane. 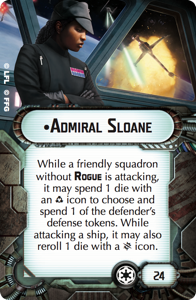 Whether you attack first with your squadrons and follow up with your Boarding Troopers, or visa versa, Admiral Sloane makes it possible for you to exhaust and then discard an enemy ship's full complement of defense tokens! Named for its distinctive silhouette, the Hammerhead corvette features a durable design that has kept the ship relevant for centuries. While the Hammerhead is officially classed as a transport, its potent engines, sturdy frame, and heavy armament also serve it well in combat. Often fielded in groups by the Rebellion, Hammerheads are agile and responsive enough to lend themselves to formation tactics and mutual support roles within a larger fleet. You'll be able to explore some of these formation tactics in Armada with even just one Hammerhead Corvettes Expansion Pack. Along with its two pairs of ship cards and a full complement of fourteen upgrade cards, the expansion introduces two pre-painted, small-base Hammerhead corvette miniatures. Just like the Quasar Fire-class cruiser-carrier, these ships can use their dual-slotted Weapons Team / Offensive Retrofit upgrades to punch above their weight. And as you might expect from a ship that Rogue One featured in a head-on collision with a Star Destroyer, the Hammerhead corvette fits perfectly into a no-holds-barred, frontal assault. 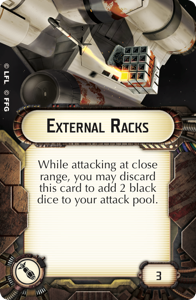 Its forward battery armament of three dice can be bolstered at close range with the missiles from its External Racks, and then if your Hammerhead bears the Garel's Honor Title upgrade, it can deal a faceup damage when it slams into its enemy. 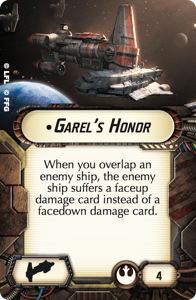 Given how crippling the critical hits in Armada can be, the Garel's Honor may quickly become one of your most-feared small-base ships, especially if it can flip additional damage cards faceup through the efforts of your Boarding Engineers . They're not the biggest ships in their fleets, but they're bound to make a massive impact. 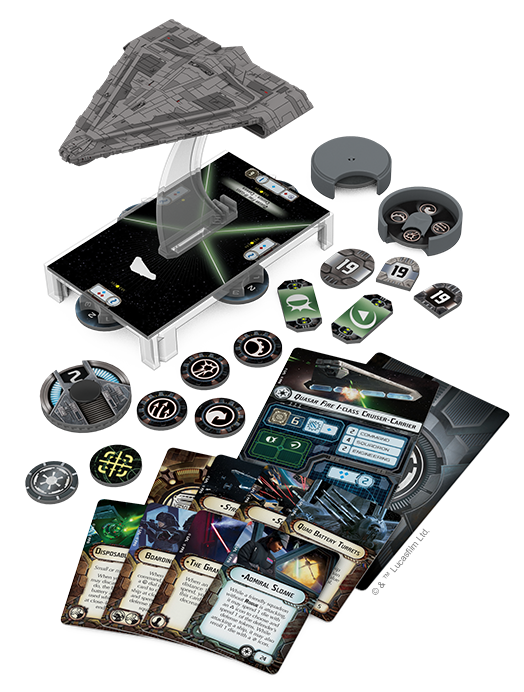 With their renewed focus on close-range combat and the introduction of boarding parties in the form of dual-slotted upgrades, the Imperial Light Carrier Expansion Pack and Hammerhead Corvettes Expansion Pack set you squarely on a collision course with the next evolution of Armada. 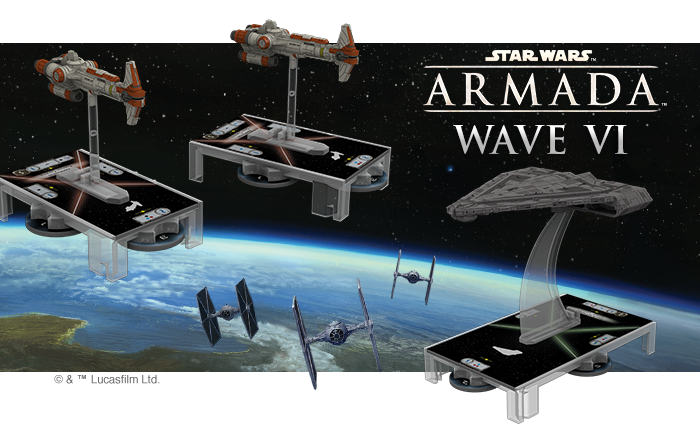 Look for these Armada Wave VI expansions to arrive in the second quarter of 2017!